In November, 1982, Kathy and Dave Burdett purchased an existing gun and fishing tackle store located in Hearne, Texas. 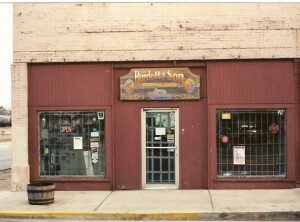 Burdett & Son Sporting Goods operated in Hearne until July, 1992 at which time it was relocated in the Townshire Shopping Center on Texas Avenue in Bryan. Upon reopening the store in Bryan, Texas in Townshire Shopping Center, the name was changed from Burdett & Son Sporting Goods to Burdett & Son Outdoor Adventure Shop. The character of the business changed to add a larger selection of ammunition, reloading components and equipment, archery and Boy Scout inventory. Fishing tackle was discontinued. In June of 1997, a decision was to move to a more central location in College Station, Texas to better service our customers. The store doubled in size when it relocated to the Redmond Terrace Shopping Center in College Station, Texas. Hiking boots, backpacks, new lines of clothing, kayaks, canoes and even a few sailboats were added to the inventory. Archery equipment was discontinued at this time. In June of 2002 the shopping center changed ownership and a large scale remodel forced us to find a new location. After leaving the Redmond Terrace location, we purchased and occupied our own building which is our present location. We reopened in June of 2002, at 1055 Texas Avenue South in College Station, Texas. Items such as canoes, kayaks, and hiking boots were discontinued. Our inventory continues to expand and follow trends in the firearm and outdoor industry including accessories, gun safes, clothing, NFA items, gunsmithing, and refinishing services. Our present location includes a classroom, gunsmith shop, refinishing shop, and a retail showroom. The ownership continues with the Burdett family – Dave, Kathy and Barry. Barry, an Eagle Scout, has had extensive experience in hunting, back packing, and competitive shooting. He is an accomplished gunsmith – from custom rifles and handguns to repairing and/or fine tuning all handguns, rifles and shotguns. We are located across from the Texas A&M golf course (just south of the main entrance to campus), next door to Chili’s Restaurant.